All eyes will be on former WBA welterweight champion, Ike “Bazooka” Quartey,as he embarks on the much-awaited second phase of his career with a warm-up fight tonight against American, Clint Scott McNeil,at the Azumah Nelson Sports Complex (formerly Kaneshie Sports Complex). Quartey, who had taken almost a four-year layoff, is itching to return into boxing's limelight and once again become world champion.Six months of intensive preparation, a trimmed figure and more sober image, backed by recent pronouncements suggest that the 'Bazookaman',is very determined to make up for the two losses in his career against Oscar De La Hoya and Fernando Vargas, and move ahead to reclaim a world title in the middleweight division. Tonight's fight against McNeil is expected to prepare Quartey for the bigger challenges. Although considered an underdog, Mississippi-born McNeil says he is hungrier for success than his Ghanaian opponent seems to be. Last Wednesday at a press conference, the 26-year-old American stated confidently that he would win tonight's bout because he did not travel all the way to Ghana to lose. Many boxing analysts have predicted a win for the former WBA welterweight king. Nonetheless, McNeil maintains that he would cause an upset tonight.Parallels cannot be drawn between McNeil's ring record of 18-9 (9 KOs) and Quartey's 34-2-1(29KOs) record. Interestingly, the American has never lost a fight through a knockout,with most of his losses coming through split decisions and unanimous decisions including his last two losses to Michael Moss and Hector 'Macho' Camacho,last year. Hard-hitting Quartey has hinted that he would prove to the world that he still possesses all the qualities that made him rule the world. Thus he will test the sharpness his famed jabs — one of the best in the sport — with which he stopped most of his opponents. Some of McNeil's most remarkable achievements include his defeat of Torris Smith in 2002 and 2003 to win the Mid-South Junior Middleweight and the NABC Middleweight titles respectively. He made a successful defence of the NABC title against Anthony Adams in November 2003. Quartey is determined to prove that his comeback plans are for real. 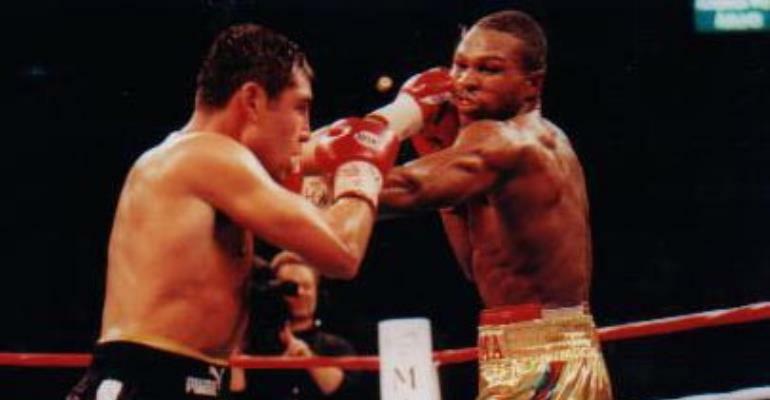 He revealed last Wednesday that he turned down a $3 million bait to fight Puerto Rican, Felix Trinidad, because he was not well conditioned for that big challenge. “I did not want to go for the money only to go and lose,” he said. “This time I think I'm ready to become world champion again before the end of the year.”Tonight's fight would to a large extent show the Ghanaian's combat readiness. While the Quartey-McNeil fight remains the biggest attraction, there are other interesting pairings on the bill. Crowd-puller and loud-mouthed Braimah Kamoko, known in boxing circles as 'Bukom Banku', will fight Jean Marie of Cote d'Ivoire in a light-heavyweight bout, with Osumanu Adama will be fighting Ivorian Solo Issah in a middleweight Commonwealth title eliminating bout. Nigerian Basel Ozikwe will mount the ring to face Ghana's Charles Adamu in a super-middleweight bout, while Philip Kotey faces Nigerian Ola Shakilu in a welterweight contest. Lartekwei 'Shocker' Hammond and Ken Moyanga of DR Congo will slug it out in a welterweight clash,while welterweights Ishmael Tetteh and Thomas Awinbono sort it out over eight rounds.Promising George Ashie will face Beninois, Tijani Salifu, in an eight-round featherweight contest.